You are here: Home / Our Animals / Chickens / These 10 Frugal Feeds & Chicken Water Feeder Hacks Are So Easy! Raising chickens can be as expensive or inexpensive as you want to make it. These 10 frugal feeds and chicken water feeder hacks are easy – and we’ve used them on our farm to help our flock (and our wallets) be healthier! When it comes to raising chickens, I definitely think cutting corners is a bad idea – it puts your flock’s health at risk and might harm them in the end. But that DOESN’T mean you have to spend a million bucks on your hens. So, in this article, I’m going to show you 10 inexpensive hacks that will help your chickens be healthier AND that chickens love! 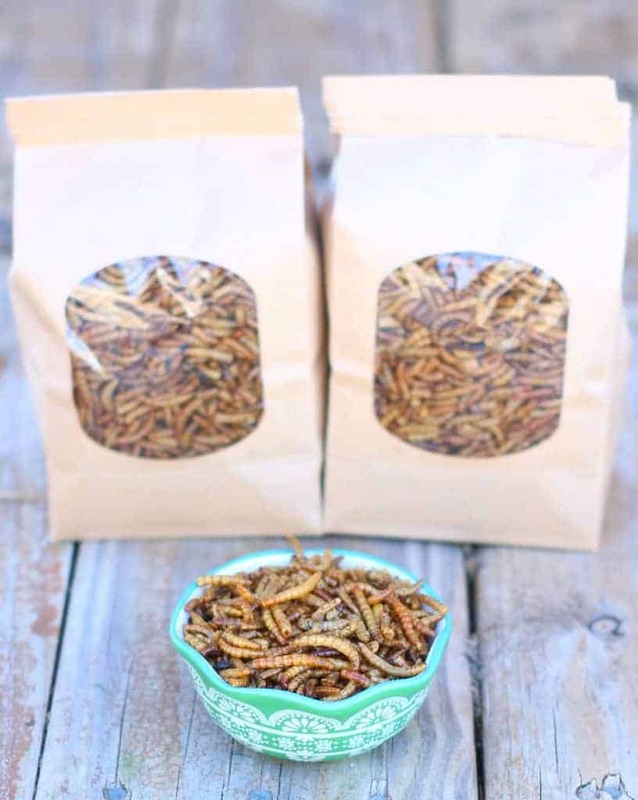 Raising mealworms is easy. Mealworms are the larvae of the darkling beetle – and raising them doesn’t take much space or investment. In this article about raising mealworms for chickens, I show you step-by-step how to raise them in a dark, quiet corner of your farm. 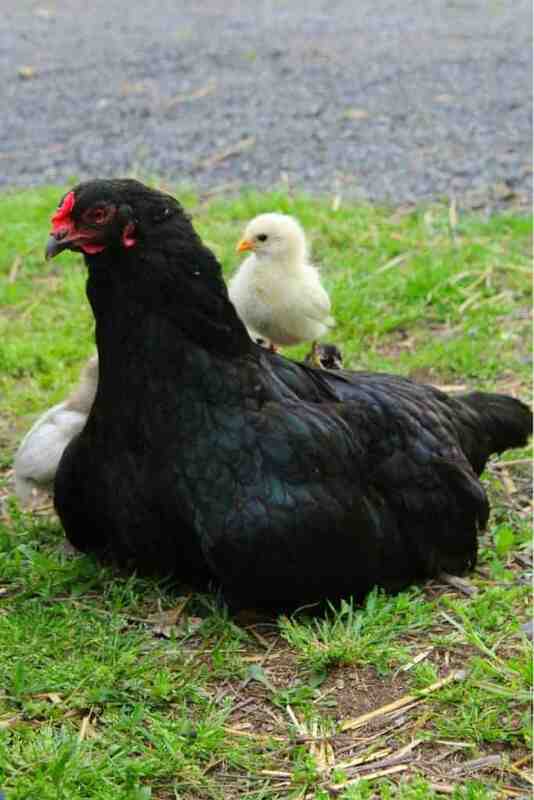 And chickens (especially my silkies and brahmas) love them! Raising black soldier fly larvae is another option. Black soldier fly larvae are extremely healthy for chickens – with lots of protein and calcium, they’ll help your flock lay better eggs, grow beautiful feathers, and more! Here’s my best article about black soldier fly larvae for chickens if you want more information. We all know fresh is better – and nothing is better than fresh food for your hens! One way we save some money on chicken feed and provide the flock with some healthy snacks is by devoting a corner of our garden to growing herbs and greens such as lettuce, kale, spinach and more for our flock. Herbs are wonderful – they have way too many uses in the coop for me to list here. Everything from helping your hens lay better to being healthier! This is truly one of those genius ideas that takes just minutes but can be a lifesaver for your flock, especially on those super hot days! Water is critical for your flock to stay healthy – chickens have a higher body temperature than humans, and feel the heat more than we do. Every day, you should double check (and during the summer, check several times a day) that your flock has free access to water. This water is also easy to clean – just be sure to use a food-safe plastic bucket. If you have extra buckets hanging around, then you can easily use this hack! My full plans to build an automatic waterer for under $12 are right here. If you don’t want to make one, you can check out our review of the 7 best feeders on Amazon here. PVC feeders are pretty popular – you can just drill some chicken-sized holes in a PVC pipe to stop your flock from throwing their feed everywhere. This also will help keep mice and other critters out of the coop, since they won’t be attracted by the grain everywhere. You can use these plans – and it should only cost you a few bucks. Sprouting fodder is really easy – and I suggest only using seeds such as wheat and barley. If you don’t know what it is, fodder is simply seeds that have been sprouted into grass. Seeds such as sunflower seeds, etc are great for sprouting – but fodder takes it to the next level by producing an actual grass. Chickens LOVE it – they get the benefit of the nutrients from both the seeds and the grass. Your wallet will love it too, because while you’ll have to pay for the seeds, you’ll be maximizing your investment by quadrupling the nutritional benefit of the seeds! You can read my growing fodder for chickens tutorial here. Apple cider vinegar is wonderful for your chickens! If you’ve never made it, you can download my “How to make apple cider vinegar” video here. It can help keep your waterer clean because it introduces beneficial bacteria – and it’s great for your flock’s digestive system! In the winter, you can add it to their water daily (and if you have chicks, you can add it to their water too!). In the summer, if you’re concerned about the vinegar dehydrating your chickens, you can limit it to once or twice a week. One of my favorite frugal feeds hacks is to buy grain for your chickens in bulk – we’ve been able to save SO MUCh doing this, and we can get all non-GMO feeds this way. The best way to do this is to contact grain manufacturers in your area. If money is REALLY short one week, you can always scramble your flock’s eggs for them to eat. It’s not weird and it’s not cannibalism – eggs are full of protein, and chickens love them! The shells also contain calcium, which will help your flock lay great eggs with strong eggshells. Mix them with herbs from your garden to make them even healthier (try oregano), and (I promise) your flock will go BANANAS for them!! Just be sure to add the fresh herbs AFTER the eggs have been cooked to preserve the essential oils in them! 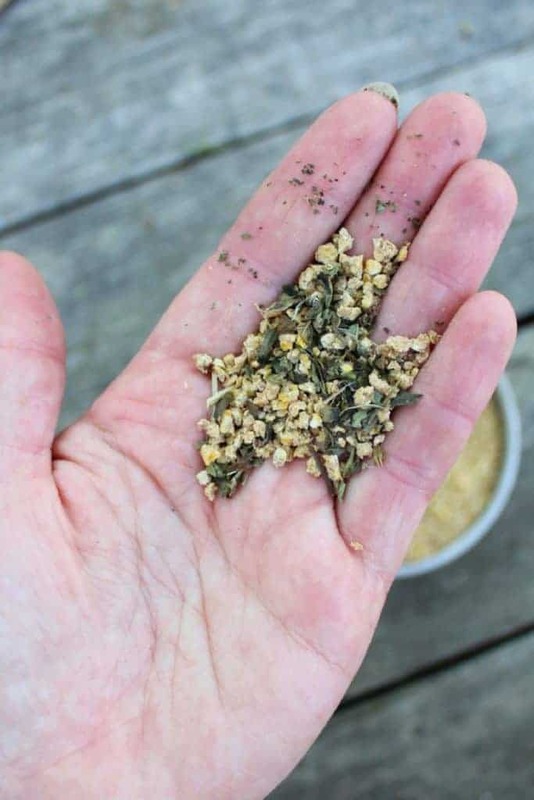 Yes, you CAN make your own chicken feed! 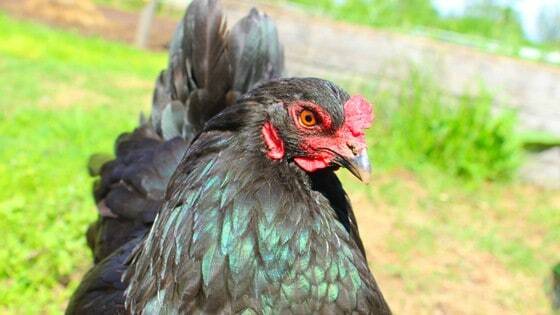 And in this organic chicken feed recipe, I show you just how to do it! You will have to buy all the individual ingredients, so it’s a bit of a process, but especially if you can find a bulk supplier, you can save quite a bit! If you don’t have time to make your own feed, then you can always try to buy non-GMO feed in bulk from a grain manufacturer (see above). If one of your goals is to save money when raising chickens, then making sure they stay healthy is important. Everytime you bring them to the vet, your care bill increases! One thing you can do yourself is try to boost your flock’s immune system, and garlic is a great way to do it! You can use garlic granules (which we sell in the store here) or simply chop fresh garlic and add it to their water. The essential oils – allicin – in garlic has been shown in studies to improve immune systems. You can start by adding garlic to your chicken’s water feeder once a week and make sure they’re drinking it. Go with 1 clove per gallon of water.